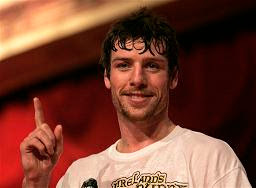 For the first time since his return from Ireland New Yorkers got a good look at boxer John Duddy. Fans and media were on hand as he worked out Tuesday morning in the basement of the Hard Rock Cafe in Times Square in preparation for his next fight which could lead to a title bout. On Saturday, February 23, Duddy will defend his IBA World middleweight title against Canadian boxer Walid Smichet at Madison Square Garden. The matchup is an undercard of the heavyweight title unification contest between IBF champion Wladimir Klitschko and WBO counterpart Sultan Ibragimov. If he is victorious he will challenge the reigning WBC and WBO unified middleweight champion Kelly Pavlik this June 7, but Duddy's focus is on his upcoming challenger, Smichet. The match this Saturday will be Duddy's first in America since May 18, 2007 against Dupre Strickland. Since that time he has been in Ireland working with a new trainer, Don Turner, to hone his skills and make him better prepared for the next challenge. Duddy took the time off from boxing in America to work with his new trainer because he was often criticized as being too much of a brawler type boxer. He was always considered a decent prospect, but it was said that he could never raise up to challenge tougher opponents because he was lacking in the skills needed to elevate his game. Last July, Duddy, a native of Derry, returned to Ireland in what was dubbed his “Homecoming.” He faced Alessio Furlan and beat him by TKO with 10 seconds to go in the final round. He then went on to defeat Prince Arron in two rounds the following October. In his last fight before returning to America, Duddy faced his toughest challenger Howard Eastman. Duddy defeated Eastman in a close matchup in front of nearly 6,000 fans. Ultimately Duddy knew that to take his fighting to the next level he had to return to America. Overall Duddy is undefeated with a record of 23-0 with 17 of those wins coming via the knockout. His opponent this Saturday, in the co-main event, Smichet has a record of 17-3-3 with 13 KO's. The match will be his sixth to take place at Madison Square Garden and his biggest step toward a world title since beating former world champion Yory Boy Campus.